i am CANADIAN! i am proud to be CANADIAN! The XXI Winter Olympics were a turning point for the country and have become a major source of pride and chest-beating from sea, to sea, to sea and even overseas! It is nothing short of spectacular; indeed one could even say it is almost un-CANADIAN! Canada? Top of the gold table? At an Olympics? Take off, eh! 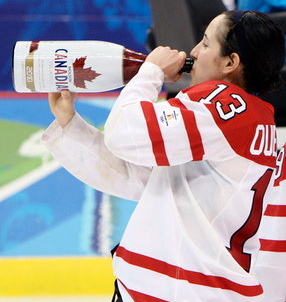 Canadians are far more used to coming up short at Olympic Games that we host. Infact, before the Games of the XXI Winter Olympiad in Vancouver, we were the only host country never to have won even one GOLD medal at an Olympic Games that we’ve hosted. And, being CANADIAN, we took that dubious honour to the next level, we’d failed when hosting both Summer and Winter games. 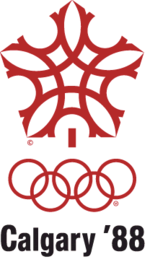 Prior to 2010 Canada hosted the XXI Summer Olympics in Montréal and the XV Winter Games in Calgary. Not only did we fail to win even one of the 198 gold medals on offer in Montréal, we also walked away from Calgary, empty handed, without even one of the 46 gold medals up for grabs. Participating in an Olympic Games is, for most athletes, something they can only dream of. Only a select few of those constantly training, day in and day out, qualify to represent their nation on the Olympic stage. Attending an Olympic Games as a sports fan is also far from common; they only occur alternately every two years, Summer Games followed by Winter Games; they are held all over the world and can be prohibitively expensive to go to and difficult to get tickets for. In 1975 i applied for tickets for the 1976 Games. In February of ’76 i was informed that i was going to be allowed to purchase some tickets! Not for the popular Opening and Closing Ceremonies but for a wide range of sports including swimming, track and field and several finals: Field Hockey, Grand Prix Team Equestrian Jumping and Football. i ended up having an extra ticket to the football final and scalped it on the morning of the final. The Pole buying the ticket couldn’t believe i only wanted the face value of the ticket; i asked him to buy me a beer that evening as i’d be sitting right beside him. He was more than happy to oblige. We also managed to see some events for free: the marathon, canoeing. It was at the canoeing where the spirit of the Olympics really came to life. We were just walking along the basin when two young men in green and gold came up and started talking to us. The first time in my life i’d ever met Aussies. They were extremely friendly and we chatted briefly about their medal hopes (none against the Eastern European juggernaut). Little was i to know that meeting them would the beginning of a wonderful, albeit distance, relationship with Australia and Australians. (Between 1993 and 2004 i established some sort of world record for successfully completing a Masters degree (11 years: off and on) at UniSA in Adelaide; currently my spouse and i are Doctoral Candidates at Murdoch University in Perth, Western Australia). “Our home and native land” once again hosted Olympic Games, this time the Winter Olympics in 1988 in Calgary, Alberta. Once again we failed to make the gold grade. But Calgarians did host a good games with the Alpine events up in Banff in the nearby Rocky Mountains. i wasn’t at these Olympics but my sister Linda, a transplanted eastern, was. A resident of Calgary since the seventies she, like most Calgarians, originally hailed from a different part of our vast country, drawn to Cowtown by the cowboys, leather and spurs… Yeehaw! Pindy managed to attend and heartily enjoy several events during the Games. Unfortunately for her, hockey tickets being at a premium, she didn’t manage to see Team Canada lose in its valiant, but fruitless, attempt to even medal at our home games. Canadians have an affinity for ice hockey. During the first six Winter Olympic Games, between 1924 and 1952 we brought home the GOLD 5 times. Then the drought began and a Canadian ice hockey team was not to stand on the top of the podium for another half a century! In 2002 both men’s and women’s teams achieved the gold standard. The XV Calgary Winter Games marked the advent of the Super Giant Slalom to the Games and also saw the premiere of curling as a demonstration sport and short-track speed skating and freestyle skiing as demonstration disciplines. These additions were to bode well for our next hosting of an Olympic Games in Vancouver in 2010.
my daughter Ayun, a Hospitality student at Vancouver Community College, was intimately involved in the Vancouver 2010 Olympics. Not even a gleam in her father’s eye the last time Canada hosted the Olympics, during these Games Ayun worked as a house-keeper in the Whistler Olympic Village which housed the Alpine event athletes. She spent her days off soaking in the atmosphere, otherwise she put in 14 hour days changing athletes’ bedding and cleaning their rooms. CUSO Nigeria comrade Peter “Dogo” Herd, living in Vancouver, had a joyous time taking in all the Olympic fever and festivities in the host city. Another former colleague, Kevin Watson, flew himself and his family from Japan for the GOLD medal men’s ice hockey final. His brother provided him with his ticket. He is sure the money spent was well worth it; a once in a lifetime opportunity! Canada came up GOLD big time in Vancouver of the 86 gold medals on tap we managed 14, a new record record for any nation at a Winter Olympics, let alone a host. 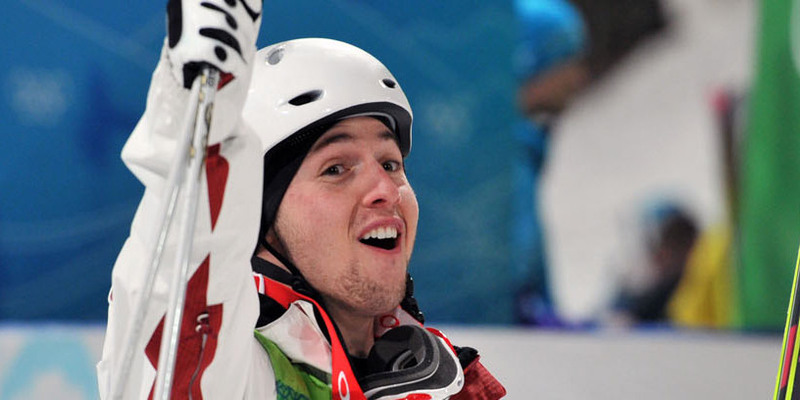 Freestyle skier Alexandre Bilodeau became the first Canadian to win GOLD at home. His medal presentation ceremony was witnessed by 22,000 jubliant fellow Canadians. their impromptu party which included cigars and a jeroboam of beer. Take off, eh! Canada‘s ice-hockey glory was to continue with a thrilling home-ice win by the men which featured nail-biting tension and over-time glory when Jarome Iginla, on his knees and elbows passed the puck to Sidney Crosby for the GOLD winning goal. President Obama had to make good on a friendly wager with Cdn. Prime Minster Harper; the stakes? A case of amber nectar: beer. It is said that Harper, rightly, refused to accept the piss-weak American version of our national beverage in payment of the cross-border wager. Could someone be fined here for out of state betting? The Games, for all their fun, friendly atmosphere and convivial competition were not short of problems. The balmy weather in host city Vancouver high-lighted problems with the snow on the slopes in Whistler and Cypress Mountain. The death of Georgian luger Nodar Kumaritashvili, while tragic, was not unprecedented. The luge is a thrilling but dangerous event. Polish-born British luger Kazimierz Kay-Skrzypecki was killed on a trial run on the Olympic course at Igls two weeks before the start of the 1964 Innsbruck Games in Austria. Skiers have died in separate incidents in the 1988 and 1992 Games. Two athletes have fallen in the summer games, during competition; 23 year old Danish cyclist Knud Enemark Jensen’s collapse and subsequent death during the 1960 Rome games led to enhanced drug testing when it was discovered that he was racing under the influence of stimulants. The massacre of 11 Israelis at the 1972 Munchen Games will never be forgotten. The horrible intrusion of terrorist violence into the sports arena lives in infamy. my one serious question is: Now that we’ve learned how to win (and win big) at home at the Olympics will we lose our Canadian perchance for self-effacement? It is my hope and prayer that we continue to be true Canadians who let their actions speak louder than their words and that we never become too proud to laugh at ourselves with a whole-hearted beer-belly bellow! Take off, eh! Indeed! « Where in the world is Osama bin Laden?